Great news for Van Helsing fans! Today, Syfy announced they’ve renewed the TV show for a fourth season with a new showrunner. The supernatural drama enters con Van Helsing descendent Vanessa (“Van”) Helsing, who awoke from a coma to find vampires have overtaken the world. The cast includes Kelly Overton, Jonathan Scarfe, Christopher Heyerdahl, Missy Peregrym, Vincent Gale, Rukiya Bernard, Trezzo Mahoro, and Aleks Paunovic. Syfy has ordered 13 episodes for season four of Van Helsing, which will feature new showrunner Jonathan Walker. 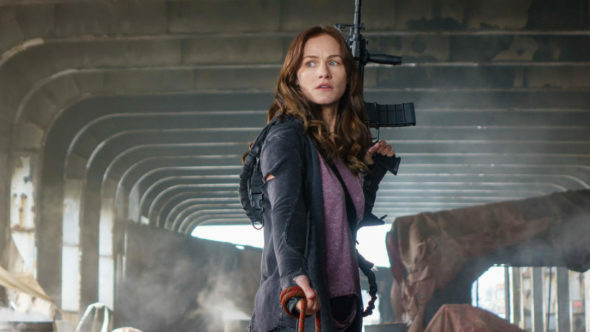 Van Helsing‘s season three finale debuts on December 28th at 10 p.m. ET/PT. LOS ANGELES, CA – December 18, 2018 – Just ahead of its season finale, SYFY has renewed action-horror series Van Helsing for a fourth season. The hour-long drama wraps up its Season 3 run on Friday December 28 10/9c and will return in 2019 with 13 all new episodes. Production is expected to begin early next year. Van Helsing is produced by Nomadic Pictures. Jonathan Walker (Continuum, Wu Assassins) will serve as Showrunner for the new season. Executive producers are Chad Oakes and Mike Frislev from Nomadic Pictures, Evan Tyler (Industry Works), Dave Brown and Zadoc Angell (Echo Lake Entertainment), as well as Daniel March (Dynamic Television). Dynamic Television is also handling the worldwide distribution for the series, excluding first run U.S. television and Canada. “Excited for a Van Helsing season four! Congrats to all our talented artists, cast and crew! Now let’s kill some blood sucking vampires,” added Michael Frislev, Executive Producer and Co-Chairman of Nomadic Pictures. “Having been in the writing room on Van Helsing since Season 1 I’m excited to take the reins as Showrunner from Neil LaBute. Season 4 will delve deeper into the iconic lore of the vampires and their ultimate goals for this world. New villains will rise along with unexpected heroes joining the fight. We have a fantastic build planned for this season and I’m thrilled to share it with our dedicated fans,” said Showrunner Jonathan Walker. Van Helsing is a total re-imagination of a timeless brand, set in a world dominated and controlled by vampires. Season three continues the story of Vanessa Van Helsing and her band of heroes as they fight to reclaim the world after vampires took over during ‘The Rising’. What do you think? Do you watch Van Helsing? Are you glad it’s coming back? I was super glad to hear of a fourth season. While this show has ups and downs… Overall the intricate twists, turns, and the detail are dam amazing considering that this is not a mainstream kinda show. I’m an older person quite familiar with the old school lore and legends. It’s awesome to see the unique and interesting interpretations and screenplay that the writer can and do paint onto to screen. I didn’t get a logic in Season 2, when Dmitri went to release elder with the key, why did scarlett and her mom go there, when they know that only a Van Helsing can open the door, if they didn’t go there, Dmitri would’ve have been able to open the door without a Van helsing (Scarlett or he mom) and come back to them, so there they could have fought or something. Awesome!! I love Van Helsing. It’s so awesome. Love vamp stuff, has been a while since I found a goodie. Love that there are different types of vamps. Keeps it interesting… Not just a survival thing but a whole story with history too. Amaze! I liked season 1 and how it started. But the show got kinda stupid with all the different vampires, especially the sisters with white faces. It should be back to survival , man vs vampire, man vs man, not with the dumb super vamp bs. Hell yeah brother! Didn’t want to try to find a new show so keep them coming! It would be great to find out what happens next in further adventures of Van Helsing…I enjoyed watching this show, this is the best tv show of this genre, ever..! Love van Helsing! Happy to hear about the next journey of Vanessa Helsing for season 4. New show runner? That’s rarely a good sign. Hell Yes!! I am liking how the actors are getting better at acting, especially Missy with her lead in in a major network show. So glad for season4. Love Van Helsing!! !